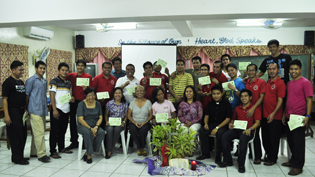 In 2012, the NCCP launched the HIV/AIDS program with the goal of making church people more aware of the issue of HIV and AIDS and help in “Building Compassionate and Caring Churches and Communities with People Living with HIV and AIDS.” The NCCP embarked then in several regional trainings nationwide for NCCP member churches. In all these trainings the participants drew plans on how they will start their own advocacies in their own churches. Last March 20-21, 2013, the Western Visayas Ecumenical Council started to re-echo the HIV and AIDS awareness campaign among local churches in the Visayas region. This was attended by 28 participants from St. Paul Seminary of the Iglesia Filipina Independiente (IFI), United Church of Christ in the Philippines (UCCP), Convention of Philippine Baptist Churches (CPBC), United Methodist Church (UMC), and The Salvation Army (TSA). During the opening worship, Rev. Jeremiah Lorenzo, Chaplain of the Iloilo Mission Hospital of the CPBC gave the Biblico-theological reflection (BTR). The program consisted of inputs on HIV/AIDS, mainly on the current health and social situation of people living with HIV (PLHIV) shared by Ms. Charity Perea, DOH Coordinator for HIV and AIDS in Ilo-ilo. Mr. Jay Roy Tipayan of NCCP gave an input on the highlights of the Philippine AIDS Prevention and Control Act of 1998 (RA 8504) focusing on the articles on education, awareness, confidentiality and discrimination in the work place. In the course of the 2-day training and workshop, the participants looked at how the churches can create safe spaces for PLHIV through the leadership of Ms. Rose Camba (UCCP). Some of the basic courses of action that churches can take to create spaces for PLHIV is to include information about HIV and AIDS in liturgies, prayers, and sermons. Ms. Arceli Bile of NCCP led the Bible study that focused on churches as inclusive and redemptive church/community. Another BTR was shared by Ms. Sharon Rose Joy Ruiz-Duremdes that focused on HIV, AIDS and Sexuality. In Tarlac City last March 23, 2013 the United Methodist Young Adults Fellowship organized a similar echo seminar on HIV and AIDS awareness. This was attended mostly by young people ages 18-35 years. This echo seminar is again a result of the NCCP HIV and AIDS awareness training and workshop for churches in North Luzon. The youth listened to a testimony of a person living with HIV. According to the PLHIV, he is appreciative and grateful for the acceptance and support of his family. He is now active in educating others on HIV and is now involved in a project-based program of the Department of Health. The participants were also given a few basics of counseling skills in case friends confide to them that they tested positive with HIV.